The entrance of multinational pharmaceutical companies into Canada’s cannabis sector will mark one of the next major themes in the industry, analysts told Marijuana Business Daily. Such eventual moves by Big Pharma will provide even more credibility to a sector that has already seen the entrance of alcohol and tobacco giants. “The missing link is in the pharmaceutical part of the equation,” David Kideckel, director of Altacorp Capital’s life sciences division, said in an interview with MJBizDaily. Thus far, there have been no major direct investments from pharmaceutical companies into medical cannabis licensed producers. But a recent Altacorp report said that drought could “come to a halt” once the U.S. legalizes cannabis at a federal level. “As far as making really big deals, I don’t think you’re going to see anything substantial in terms of an equity stake until companies feel more comfortable with where U.S. federal policy is going,” Kideckel said. Kideckel recently initiated coverage of Valens GroWorks, Auxly Cannabis Group and GW Pharmaceuticals. In the meantime, the cannabis sector can expect to see more partnerships such as Tilray’s deal with Quebec-based pharmaceutical firm Sandoz AG and CannTrust’s deal with Ontario-based Apotex. Who are the likeliest targets for Big Pharma? 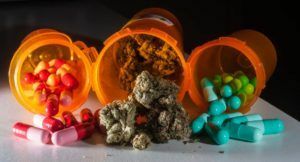 “Companies involved in the cannabis space with competitive differentiation surrounding their R&D capacity, clinical trials program or commercialization efforts would be a prime candidate for Big Pharma to engage in talks with,” Kideckel noted. Alcohol and tobacco are stepping stones to “the really big brands that will ultimately arrive here,” said Khurram Malik, a partner with Toronto-based financial advisory firm Jacob Capital Management. Legacy companies are waiting to see who can successfully build brands in the THC and CBD industries before pulling the trigger on major M&As. Coca-Cola said in September it was eyeing the development of CBD-infused beverages, and Bloomberg reported the beverage giant was in talks with Aurora Cannabis to develop such a line. “As far as CBD goes, until cannabis companies have a large enough consumer recreational brand presence, they’re not going to sweep in,” Malik said. He said nondiversified beverage or tobacco companies might be more inclined to get involved earlier to help develop products and brands to stem potential losses from cannabis, but diversified consumer packaged goods companies are in no such rush. Those organizations don’t feel the same competitive tension to get involved in cannabis, he said. The U.S. consumer goods marketplace has been mature for decades. Product innovations-to-market is where major top line growth is achieved meaning trends are in R&D development today. This includes cannabis. The massive CPG’s take 2-4 years to get a mass manufactured, tested, distributed, and brand developed product to market. Scaling through acquisition is not the only opton. Just because we aren’t seeing the investment front shouldn’t make us believe there’s no development happening on the quiet sideline. This is a conversation I have routinely and know from 25 years in that space, we’re not watching where that innovation is happening.